The early news out of Cannes, where the glitterati of the advertising world have gathered to rub shoulders, quaff rosé, do deals (or at least talk about doing deals) and generally celebrate their own creativity and business acumen in the hopes of snagging business from the legion of CMOs taking advantage of what has to be the best boondoggle on the planet, is that a marketer backlash against influencers is growing. At least according to Digiday’s piece on June 20th. The basis for the argument is the announcement by Unilever CMO Keith Weed on Monday that the company is pushing for greater transparency in influencer marketing to combat fraud, create better consumer experiences and improve measurement. This is noble, and I commend Unilever for taking a position. I take exception to the idea that we can have backlash against our customers. Influencers, true influencers, are our customers. People who love our products and want to share their opinions with their friends, family and fans. So let’s reframe this accusation before we go too far. What we are reacting to is fraud, perpetrated largely by automated systems in the search for scale. Yes, people bought followers to make their numbers look better. But the root cause — and this is true for many digital fraud issues —is the holy grail of scale over all else. Reach as many people as you can at the least possible cost. The volume ensures a certain percentage of buyers. Except at some point, the volume becomes the goal, not just the means to the goal. We’ve been seduced by delivery metrics, taking shortcuts that promise to deliver more, for less. It’s a cycle of inflation that “looks good” but doesn’t actually deliver to our objective. Why are we always so surprised when the shortcut turns out to be a dead end? The problem isn’t influencers, who are, after all, your customers. It’s the never ending search for scale without a similar commitment to authenticity and performance metrics. I suggest (and have for years) that we think about consumer to consumer marketing differently. Ground your influencer marketing strategy in authentic relationships with customers who want to advocate for your brand. Don’t neglect those with smaller follower numbers; sometimes they are your most effective evangelists. A good influencer marketing strategy activates customers with all degrees of influence, using tactics that take best advantage of both the customer’s passion and her platform. The performance that matters is conversions. Everything else is a delivery metric. Even engagement. Although it can be a conversion metric for some objectives, for the most part, it too is simply a way to measure the delivery of a program. 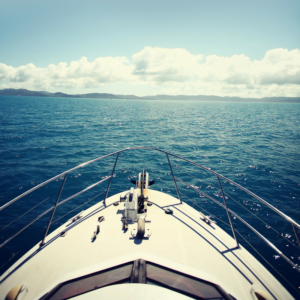 Make sure your program has a conversion metric, and a way to get there. You can’t convert without a call to action. Link back to sales. You can be super sophisticated using modern marketing platforms. Or you know, simply start tracking sales over time against marketing activity, including influencer. How de we avoid fraud in influencer marketing? Stop chasing scale and start working with your friends. Measure what matters, not everything that moves. Earlier this week, the FTC released an updated version of its .Com Disclosures guidance for digital advertising, originally published in 2000. 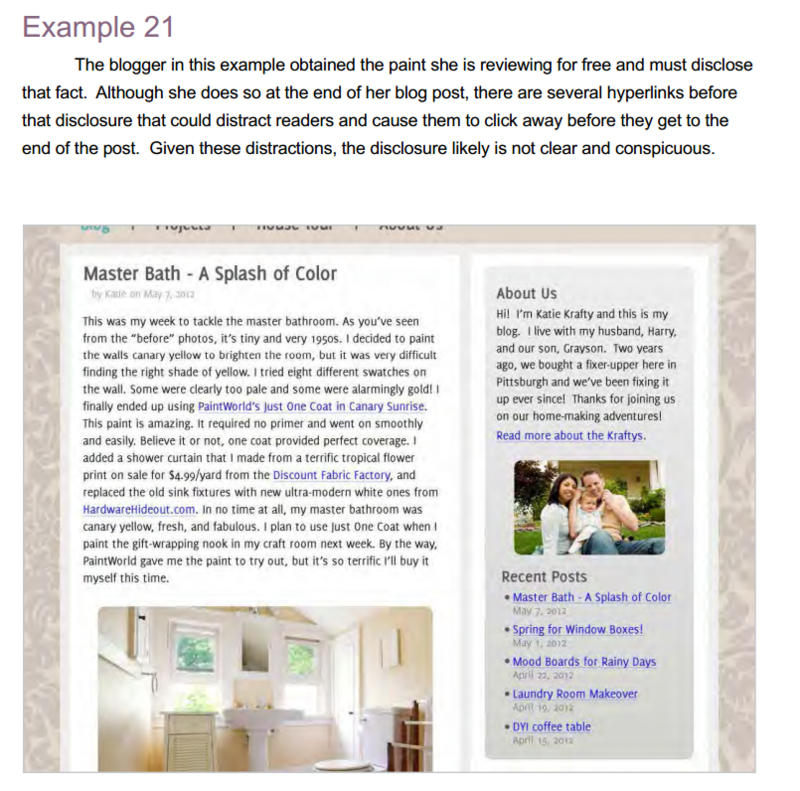 While there is some new information here for bloggers and social media influencers who produce sponsored content for advertisers (and I will get into that below), the document’s principal goal is to provide guidance for proper disclosure of advertising claims in digital, and especially mobile, advertising in light of new technologies. Much like the changes in the endorsement guides in 2009 that were prompted, in part, by the rise of social media and blogs. Simply put, the FTC is making sure that, as ad delivery technology changes, claims are properly disclosed and not “lost” in the translation from web to mobile displays. From the social media perspective, most of the information related to accuracy of claims and disclosure of relationships is the same as is covered in the 2009 Guidance on Endorsements and Testimonials. In other words, there isn’t all that much new here. You still need to disclose material relationships with brands, in a clear and conspicuous manner proximate to your endorsement, and both you and the sponsor have an obligation to be accurate in your claims about a product. Read my detailed analysis of the examples in the 2009 guide if you want more detail. Is there anything new here for bloggers? Why yes. It’s not a lot but it’s very nice. 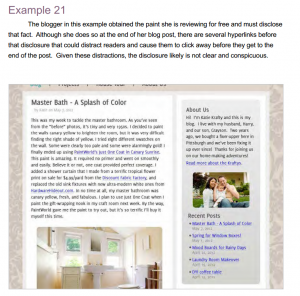 The .Com Disclosures document includes new examples that will make it easier for people creating sponsored content to comply with the FTC Guidelines, as well as clarity on the proper ways to disclose additional required information about product claims. Where and how to disclose. As far back as 2009, the FTC was already publicly recommending that disclosures not be buried at the bottom of a post or on a separate page (Once More With Feeling: FTC guidelines, bloggers and companies). Now, however, we have an explicit example. Takeaway: Do not put your disclosure solely at the bottom of your post. Recommendation: Include a brief disclosure at the top and if necessary, provide additional details at the bottom. Note that the FTC also explicitly stated that the form of the disclosure should match the content. If it is a video or sound file, the disclosure should be done in the native format — ie in the video or recording, not simply included in a post or annotation on a social site. The disclosure needs to travel with the content. However, the exact words you use to disclose? Still up to you. The disclosure must be in every Tweet. You can’t tweet a single disclosure that covers the whole conversation; there is no guarantee that readers will see the disclosing statement. The hashtag #spon is not sufficiently clear. The word “ad” is sufficiently clear, but needs to be in a prominent place. The FTC also suggests not using a #ad hashtag after a URL or shortlink as it could be overlooked. Use #ad to disclose along with any hashtag the sponsor has requested, but NOT proximate to any URLs in your tweet/update. Make sure the disclosure stands out. The .Com Disclosures also included one other tidbit that was clearly aimed at advertising disclosure of claims, but is valuable for bloggers as well. When an advertising claim merits a longer disclosure than is practical for the format, a hyperlink to additional information is acceptable, provided that anything material, or “triggering” is included in the original advertisement and the link is clear and conspicuous. In other words, you cannot bury CRITICAL disclosures in hyperlinked pages, but you can provide additional details. “Hyperlinks allow additional information to be placed on a webpage entirely separate from the relevant claim. Hyperlinks can provide a useful means to access disclosures that are not integral to the triggering claim, provided certain conditions (discussed below) are met. Hyperlinked disclosures may be particularly useful if the disclosure is lengthy or if it needs to be repeated (because of multiple triggering claims, for example). However, in many situations, hyperlinks are not necessary to convey disclosures. If a disclosure consists of a word or phrase that may be easily incorporated into the text, along with the claim, this placement increases the likelihood that consumers will see the disclosure and relate it to the relevant claim. Disclosures that are an integral part of a claim or inseparable from it should not be communicated through a hyperlink. Instead, they should be placed on the same page and immediately next to the claim, and be sufficiently prominent so that the claim and the disclosure are read at the same time, without referring the consumer somewhere else to obtain this important information.” — from the .Com Disclosures Guide. Emphasis mine. This could be extremely useful for sponsored programs for products and services in highly regulated industries. The sponsored post would still have to meet all the requirements for accuracy, with any critical product claims disclosed in the post, but bloggers wouldn’t have to include all the “fine print” in their posts. So, some nice clarity for some critical areas. But nothing to get too worried about. Unless you are creating deceptive mobile ads for weight loss products or jewelry! 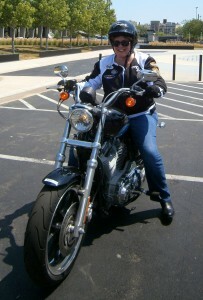 I was lucky enough to be hosted, along with 11 BlogHer Network bloggers, at a 2 day event at Harley-Davidson headquarters in Milwaukee earlier this week. Here on Marketing Roadmaps, I will be sharing some observations about the event and the impeccable execution of the Harley-Davidson team. 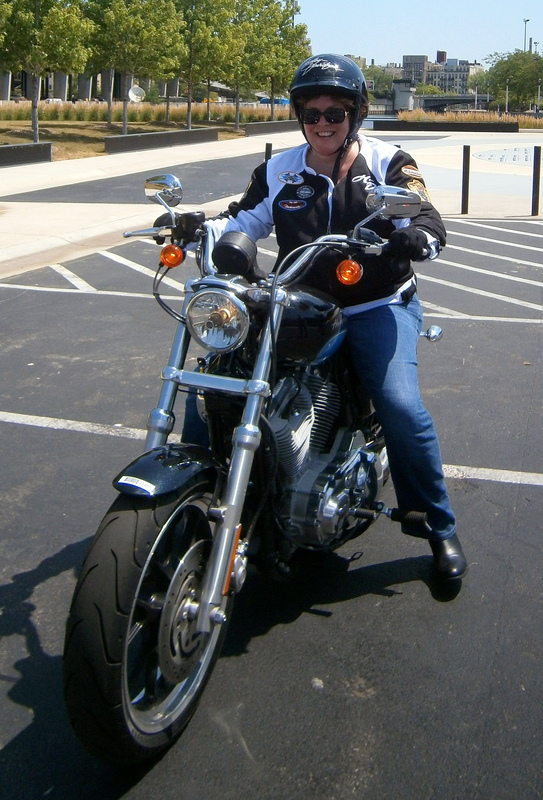 And over on my personal blog Snapshot Chronicles, I will share my personal experiences over the 2 days as well as some amazing tidbits from Harley history. Watch for these posts over the next week or so. Disclosure: I am a BlogHer employee and attended this event as a representative of BlogHer. The social media “industry” is built on the back of people doing “stuff” for free. The business models of most social networks — Twitter, Facebook, Foursquare, Flickr, YouTube etc. etc. — depend on consumers using the free/”freemium” services and thereby creating both the free content that attracts and retains users, and more importantly, a mine-able database. People. Topics. Linkages (who are your friends, what do you like, where do you go). Marketing gold. And the companies are reaping the benefits of our “work” in potentially ginormous valuations, as discussed in this Businessweek article. You could argue that posting on Facebook or sending a tweet isn’t work per se. We, the users, are getting something in exchange for our activity — the use of the network to accomplish a personal objective. The question is whether the value is balanced — are we getting enough from our participation in exchange for the value we are helping these companies build? Honestly, that’s a question that each person must answer for themselves. Participating on Facebook DOES mean that you are surrendering some of your personal privacy, and a great deal of personal information that is going to be aggregated, analyzed, mined and sold. Every Facebook item you post, link or share is going to earn money for Facebook and its investors somehow. Maybe ad revenue. Maybe data mining revenue. But certainly revenue. Facebook is a business, not a public service. Is it worth it to you? If yes, play away. If not, don’t. And of course, you can figure out ways to monetize YOUR participation in the networks. Use them to promote your business. Or yourself. It’s all about extracting the value you require from your participation. The other “work for free” model prevalent in the social media space is influencer relations, which owes its structure to the earned media model inherited from public relations. I’ve written about this before — Is earned media an anachronism? In a nutshell, the idea is that companies and brands can have such compelling stories that consumers will write about them, share them on their social networks, for free, without compensation. And you know, sometimes that’s true. Sometimes a product is so compelling that we are happy to harness our word of mouth for no other reason than we love the product. Perhaps Apple products are the only ones that can generate widespread mass word of mouth at the mere whisper of a new version, but we all have things we love that we’re happy to share just because we love them. I’ll use myself as an example. Recently I bought a SpotBot Pet, a little spot carpet cleaner from Bissell that I first learned about at the BlogPaws conference. It is TERRIFIC, and eventually I will get around to posting a review on my personal blog. But… products we are intrinsically passionate about are few and far between. Certainly far fewer than the number of firms reaching out to bloggers asking them to work for free on behalf of the brand. To write about a new product. Or attend an event and tweet it up. And so on. So here’s where I draw the line. If it is work — if you are asked to do a specific thing in a specific fashion or to a deadline — you should be compensated for your time and expertise. Because if you are not paid for your work, it is volunteer work, and if you are going to volunteer for something, it should be something that you care about personally and passionately. I’m pretty sure cereal and motor oil don’t qualify. At least for most of us. Is a free product adequate compensation? In my opinion, it all depends on what you are being asked to do. Try the product and participate in a short survey? Or leave a comment on a Facebook page? Probably yes. Try the product and write a 500 word blog review? Unless it is use of a car for a year or some other equally large “in kind,” probably not. It’s your call, but remember that the FTC and the IRS do not distinguish between cash and “in kind” compensation. You get a free product, you must disclose, and if you get enough of them, you probably should be reporting the “income” on your taxes. Disclaimer: not a lawyer, not an accountant, consult yours if you have questions about your legal obligations, especially for taxes, which unlike the FTC guidelines, DO have defined penalties for getting it wrong. So, if you are working in exchange for free product, whatever it is, best to make sure it is something you actually want. Because you may have to pay taxes on it. If it is not something you need or want, cashy money probably would be more useful. A final point on working for free. I am not saying you shouldn’t volunteer your time, skills or blog content to causes — or even brands — that you care about and want to support. Everyone has to make their own decision on that score. However, if you do work for free, if you give it away, don’t expect the recipient to turn around in future and say, wow, you are so great I should be paying you. Volunteering in the hopes of a paying gig is a losing proposition. It is VERY unlikely to happen. So when someone asks if they could just pick your brain, or could you just post about this thing on this day and include the following three points, or whatever, understand that you have just created a non-paying customer. And no one can afford too many of those. Finallly, there’s a fine distinction that I don’t want you to miss. Doing something of your own volition — whether writing a blog, sharing a link or posting on Facebook — is very different than working to someone else’s specifications or timeline. Sometimes it is hard to tell the difference when the email box is overflowing with “opportunities.” All I can advise is to consider the value to both parties in the exchange. If it is an even exchange of value, if you are getting what you need to make it worth it (whether cash, products, connections or feeling good about helping out) and so is the other party, go for it. If not, you may just want to say no. Disclosure: I work for BlogHer. We pay the bloggers who write for us. For the past few weeks, I’ve been working on the launch of BlogHer’s new consumer panel, Visionaries. I’m very excited about the possibilities we have with the panel to connect the BlogHer audience with brands. Once or twice a month, we’ll be sending panel members a survey or perhaps even an offer to try a free product. 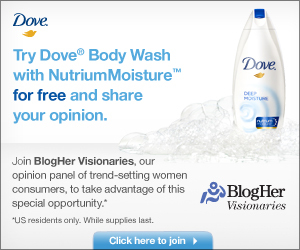 The first trial offer is in the field — sign up for Visionaries now and get a full 12-ounce bottle of Dove® Body Wash with NutriumMoisture™. Over the past few years, I’ve written quite a bit about blogger relations, largely in the context of brands reaching out to bloggers. As I mentioned in my last post, lately I’ve started to think about it more in terms of influencer engagement. The key to success in social media engagement is to forge strong relationships, deliver relevant content and most importantly, respect the writer and her readers. As a starting point for developing long term sustainable relationships between brands and social media influencers, here are some best practices for your consideration. Focus on the people, not on your product. Pay it forward — give first, get second. Effective influencer engagement starts with reaching out to people who will have a genuine and authentic interest in a company or product. That interest is what inspires them to create a story that connects with their (and their readers’) passions. That it also mentions a product or service in some context is only a part of the story; Not all the story nor simply a tack-on mention at the end. For a conversation to be effective for both the brand and the bloggers, the inclusion of the brand has to fit (much like Cinderella’s slipper), not be forced. Social media leaders should be compensated for their efforts on behalf of brands, and the value should be balanced, with each party obtaining sufficient benefit. In other words, if the product the brand is offering the blogger is a car for a significant period of time, the blogger might consider that sufficient compensation — depending on what the brand is asking in exchange. A few boxes of cereal or tubes of hand cream? Not so much. Brands are best served by a “clean, well-lighted” space, in which editorial is clearly distinguished from advertorial content, and brand-influencer relationships disclosed. There is no such thing as too much information, too much disclosure in the blogosphere. The FTC imposes requirements on brands and bloggers for both disclosure and accuracy, but those are simply the price of admission. Long-lasting trust demands even more than a simple disclosure statement. To gain, and retain, trust, brands, influencers and communities need to be upfront about their point of view as well as their relationships with other parties. It’s the only way the consumer has all the information she needs to evaluate whether the opinion in a blog post is from a peer, and thus relevant to her life. Or simply an endorsement from an interested party or an advertisement. Both have value in the awareness/adoption process just a different one. Every conversation has multiple stakeholders – the influencers, the brands and the readers, and you have to keep all three in mind when creating a campaign. Is the content relevant to the readers’ interests? Is it interesting? How authentically does it integrate the messaging into the story without appearing forced or fake? What will the reader experience be? Develop programs that will be interesting for the social media influencers and their audiences – wherever they engage with her — not just an opportunity to get paid for a post, and that support the brand messaging, without being a product pitch. A sponsored conversation can be just as engaging as a straight-up editorial post, update or Tweet, provided that the topic taps into the woman’s passions, not the product press release. Less is often more. Reaching out to fewer influencers, but ones that have a genuine interest and desire to support the brand is usually more effective than a larger number of mildly interested folks. A few really good posts by influential women who are leaders in a community can have a stronger, more positive impact than a slew of perfunctory posts. It’s also important to consider how many influencers should be included in a program; a fatigue often sets in when multiple posts about the same thing all appear on the same day. Intended to have a positive impact, such volume actually can have negative impact on a community. “Keep your friends close. And your enemies closer.” Embrace your critics instead of trying to silence them. This is a tough strategy to follow; it’s hard to invite your critics to take a seat at the table, especially when you know there are hundreds of fans who would be happy to have that seat. Own your words. When you make a mistake, ‘fess up and apologize. A little humility goes a long way. Bottom line: nothing spreads faster than bad news. If you don’t do social media engagement right, you will face criticism. Better to do it right the first time! Check out Blog Marketing to Moms Is About More Than Parenting, an eMarketer study about the momosphere. Full disclosure: I was interviewed for the piece. On December 9th, I’ll be speaking at the Massachusetts Conference for Women at the Boston Convention Center. I’ll be doing a session on using social media to build your brand and professional reputation. The session was originally framed as an intro-level session, but feedback from the previous two conferences — in Pittsburgh and Houston — has confirmed that the audience wants more advanced content, so in Boston, I’ll be adding content on building a blog strategy. 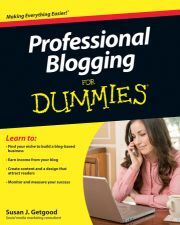 I’ll also be signing Professional Blogging For Dummies in the bookstore. Since I joined BlogHer earlier this Fall, I have had a lot going on — traveling, speaking, digging into the new job, moving my family to the NY area — and this poor blog has been sorely neglected. So neglected in fact that my 6th blog anniversary passed earlier this month and I didn’t even notice. Thinking about that milestone over this holiday weekend led me to think about some of the changes I’ve observed in the blogosphere. In 2005, early adopters were dipping their toes into the blogging waters. The hot topic was the corporate blog, and the term “social media” wasn’t even being used yet — Facebook was in its infancy and Twitter wouldn’t even be invented for another year. Public relations agencies were just beginning to reach out to bloggers on behalf of brands, mostly high tech and consumer electronics. Online conversation often swirled around the mistakes agencies and companies made with poorly targeted “spray and pray” outreach. Now, according to research conducted by the Center for Marketing Research at UMass Dartmouth, 23 percent of the Fortune 500 have public blogs, including four of the top five corporations (Wal-Mart, Exxon, Chevron and General Electric), 60 percent have corporate Twitter accounts and 56 percent have Facebook pages (The Fortune 500 and Social Media: A Longitudinal Study of Blogging and Twitter Usage by America’s Largest Companies). Furthermore, according to research conducted by FedEx and Ketchum, and reported in eMarketer, 75 percent of companies worldwide participate in social media in some aspects of their communications and marketing strategy, with 10% actively leading in the space and 15% still mostly on the sidelines observing (Leveraging Best Practices for Social Media). Another hot topic in the early days of this blog was whether the Securities and Exchange Commission (SEC) would accept blogs as an outlet for material disclosure by public companies. The SEC began studying the issue in late 2006 and in 2008, announced that it would accept websites and blogs as outlets for material disclosure under certain circumstances. The topic that has engaged me the most since I dove into the social media pool, however, is the relationship between brands and consumers. Initially, this activity was called blogger relations, a name that reflected its roots in public relations and a focus on blogs. Over the past year or two, the term blogger outreach became more prominent — in part I think in an effort to distance the work from public relations. At least that was my reason for the vocabulary shift. The sphere of activity also has extended beyond blogs to embrace social networks like Facebook and microblogs like Twitter and Tumblr, and influence is just as important as blog real estate, prompting a shift to talk about “social media influencers” rather than just bloggers. Bottom line, I am more interested in the two-way sustainable engagement, brand to influencer and influencer to brand, than I am in a one-way outreach or a single campaign. Next week, I’ll kick this off with a brief summary of some best practices for influencer engagement.